Lines from Linderhof: Coffee In the "Drawing Room"
It's always in the "drawing room"
Or living room or parlor! The coffee table is the perfect table to serve from! Halfway between lunch and tea time! Grandmother's Noritake tea plates and a pair of paper thin white and gold cups I bought ages ago and am extremely fond of. They have an initial and being me, I try to find a family member who will fit! So they can be "inherited" pieces! The "KE" on the cups are for Cousin Katherine! We like coffee with dessert! Which is silly just for the two of us! I make it into two one layer cakes. One to freeze for another day! 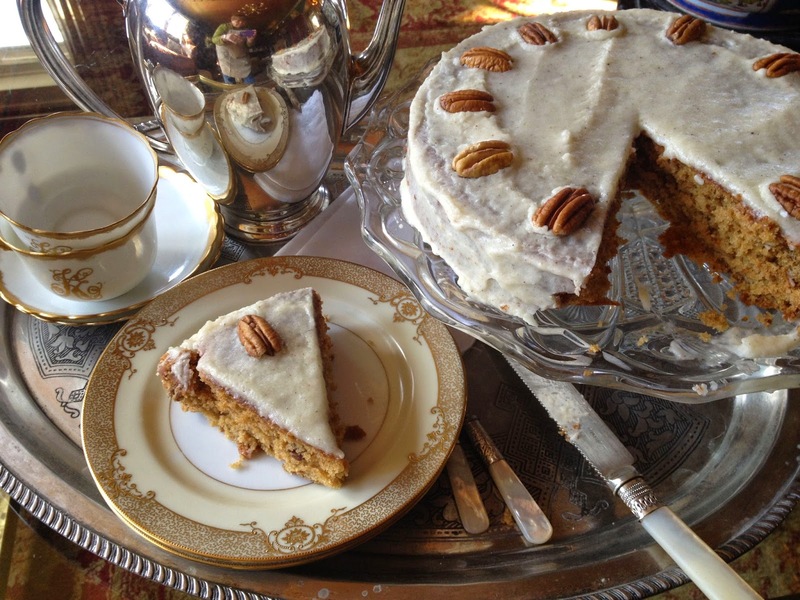 The cake is simple to make -- can be made as a layer cake or a 9 x 13 -- it's good either way! Heat oven to 350. Grease and flour two 9 inch round cake pans. In large bowl, combine flour, sugar, baking powder, baking soda, salt and cinnamon; mix well. Add applesauce, oil and eggs; blend at low speed until moistened. Beat 2 minutes at high speed. Stir in pecans. Pour batter into erased and floured pan (and I always line mine with parchment). Bake at 350 for 30 to 40 minutes or until toothpick inserted in center comes out clean. Cool 10 minutes. Remove from pan; cool 45 minutes or until completely cooled. Frosting: In small heavy saucepan over medium heat, heat butter until light golden brown, stirring ocnstnatly. Remove from heat; cool. In large bowl, combine powdered sugar, 4 T. of the apple juice and the browned butter; blend at low speed until moistened. Continue beating until well blended; adding additional apple juice for desired consistency. To assemble cake, place 1 cake layer top side down, on serving plate, spread evenly with about 1/4 of the frosting. Top with remaining cake layer, top side up. Spread sides and top of cake with remaining frosting. Garnish with whole pecans, if desired. What a nice setting you've shared today with your beautiful tray on the coffee table. Yes please Martha, I'd love a slice of your cake. Thanks for sharing the recipe with us. Oh, dear friend, I do love that you have coffee in the drawing room at Linderhof!!! The tray is beautifully styled!!! Cake and coffee. . .sounds superb on a cold Winter's Day!!! Thank you for sharing the recipe, too!!! Martha, your coffee cups are lovely and I like the initial on them with a relative in mind. Your cake looks delicious and I like how you have it all set up on a tray on the coffee table; very cozy. I like coffee with dessert too. Fact is, I prefer coffee and dessert over tea and dessert. Shhh, don't tell anyone. I usually take my tea without a sweet but my hubby prefers a sweet with his. So, baking is usually done with him or company in mind. Thank you for joining me for tea today and Happy March! 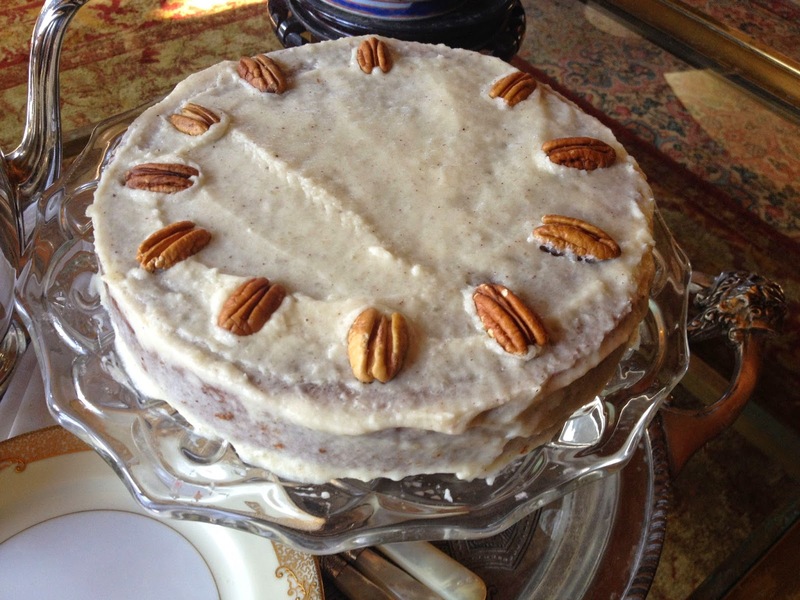 Your apple pecan cake looks delish! Love your pretty setting! The cake looks wonderful...thanks for the recipe! Everything looks beautiful and delicious. Would you recommend frosting the cake for freezing? I love the idea of 'one for now and one for a gift'. The tray is just beautiful! Lucy -- I prefer to freeze my cakes un iced and then frost them after thawing and before serving. Your presentations always thrill me! 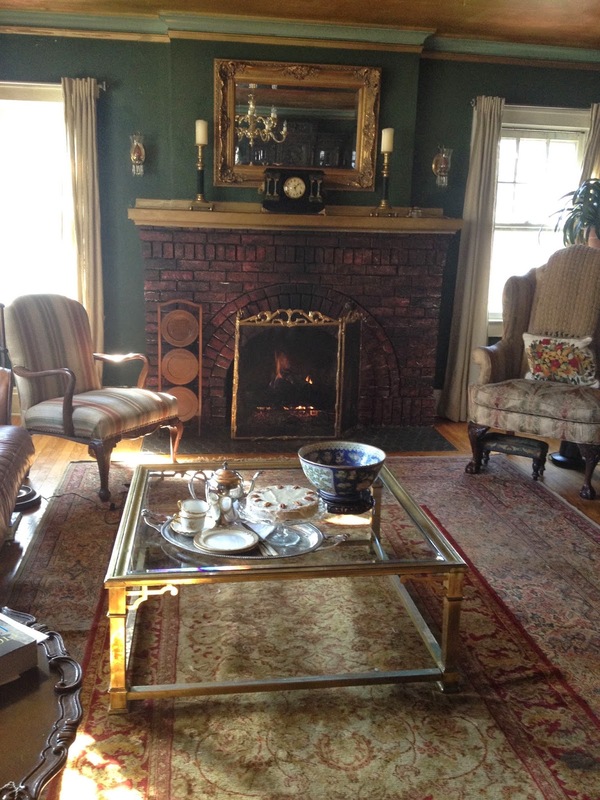 Your home is very elegantly traditional with so many wonderful antiques. I love the display on the coffee table. Your recipe is wonderful as well. I freeze many desserts too as we can't consume them all. A week or two later they are a welcomed find in the freezer when the sweet tooth attacks! The white and gold china is gorgeous! 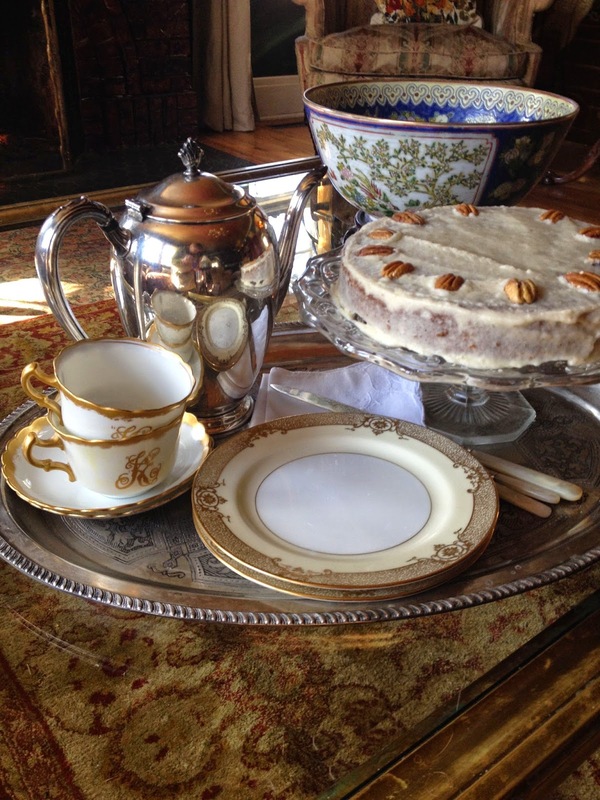 What a pretty parlor--and delicious looking cake to have on that beautiful china with those pretty teacups. Have a great week! Those Pillsbury recipes are pretty reliable, aren't they? This one certainly looks like a keeper!